The Houston Rockets have won their 65th game of the season. 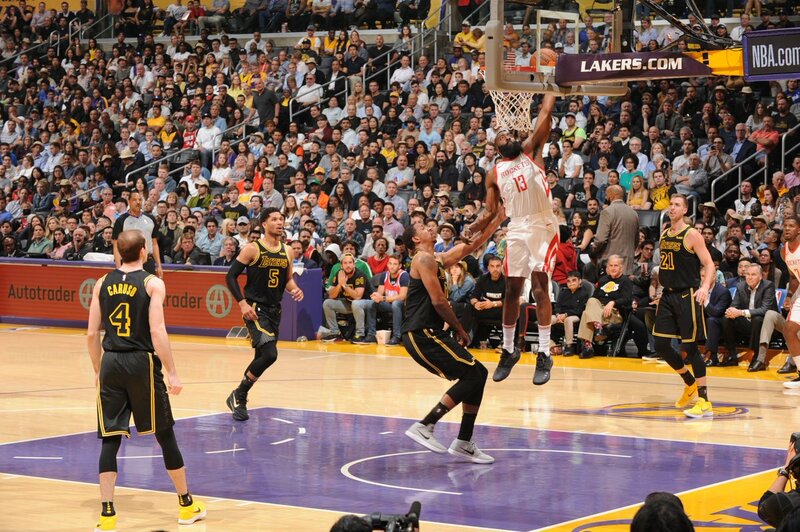 Their opposing number was a surprisingly plucky Los Angeles Lakers team enjoying (technically) their last home game of the season before playing the Los Angeles Clippers tomorrow. None of that matters for the Rockets. The only takeaway from that game was a staggering piece of bad news. Luc Richard Mbah a Moute dislocated his right shoulder in a freak accident during a dunk. In the middle of plenty of enjoyable storylines and elements, this one grim tiding hangs above everything. 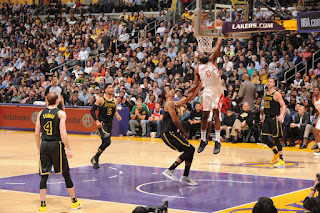 Chris Paul led the game in scoring with 22 and had a couple of highlight plays in which he repeatedly abused Lakers defender Ivica Zubac. It was a delight to watch. It still rang hollow after seeing Luc Mbah a Moute head back to the locker room. James Harden racked up 21 points and 10 assists on the way to a record number of wins for the franchise. Yes, but we just watched Luc hold his shoulder, bone clearly out of socket. The feel-good story of the night was Andre Ingram, a 10-year veteran of the NBA G-League and now 32-year-old rookie. In his first game in the NBA, the newly minted Laker scored 19 points on 75% shooting. It was heartwarming and delightful! It was also much better to think about than a nasty injury during a pointless game. There was, of course, no way to control for this. We, the twitter hoi polloi, can call for rest and advocate for sitting the entire rotation all we want. Unfortunately, even the most caution can't prevent things like this. As we saw during this game, to sit the starters for even a few minutes in garbage time is to tempt fate. The Lakers closed a 16-point gap in no time flat, getting as close as 4 points in just five minutes. To sit as many players as the league allows would be to flat-out forfeit the game. Even so, that would have been preferable to this outcome. Unfortunately, there are only so many players a team can sit before they actually forfeit a game, and in any event, Luc likely would have played. We can wonder whether or not he would have gotten injured in this scenario, but this is an exercise in utter futility and vanity. This was a freak accident, and the prudent move of sitting a couple starters does not guarantee the other rotation players are immune to injury. The only thing to be done is to wait and see the prognosis and continue onward toward the first round. The Rockets finish their season tomorrow against the Sacramento Kings, and with any luck nobody will be the worse for wear. At this point, that's all that matters.